Home > Blog > Gardening > Perenniels > What’s this plant? I was visiting my sister last week and she gave me this plant to identify. Well, as I am not an expert, I thought I could ask my gardening friends! What is this plant? It grew from a bird dropping, she says, and is now a beautiful bush, so it grows like a weed. The blossoms smell like jasmine. Is there such a thing called a Jasmine Tree? I thought it looks like Elderberry, but she says there are no berries! Any ideas? I would love to hear from you – even if you are not sure but have an idea! Thanks for ALL your help. Through this collaboration – I found out what it is!! It is Pittosporum Undulatum. Can’t wait to tell my sister! I don’t recognize it, but it looks really pretty! Hope you figure out what it is! It looks similar to my Pittosporum. It does look similar – I will do more research on it! I have just found it!!!!! 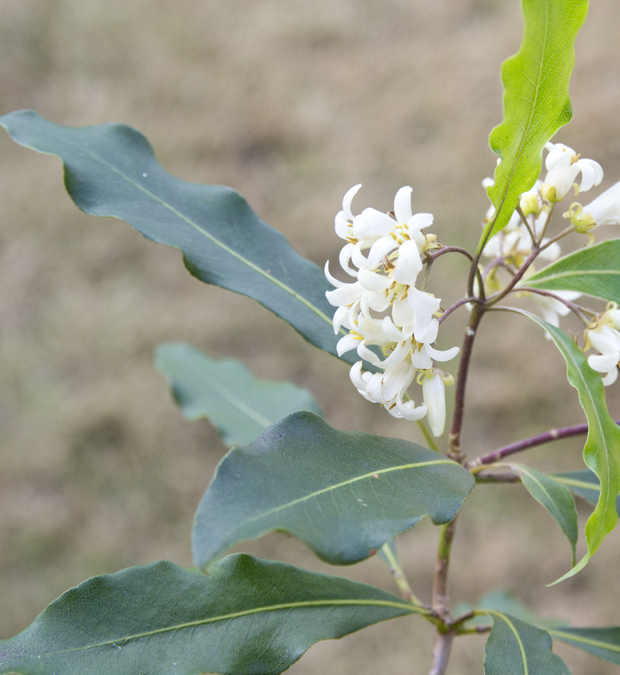 It is Pittosporum Undulatum. I found the exact photo on Wikipedia. THanks for your help !!! Definitely not Elderberry (Sambucus). You’ve got me really curious now… I’m searching. Can you post a close-up of the flowers, and a wider shot that shows the whole plant please? Ok – I will go to my sister in the week and get close up photos. I took a small branch home with me to photograph, so that is why you don’t see the whole tree. try Pavetta or Nuxia at PlantZAfrica? Or ask at Kirstenbosch, with your photo? I have just posted a blog about my Heptacodium jasminoides, Christina at http://myhesperidesgarden.wordpress.com/ noted a similarity. I am not sure as your plant is younger than mine and I cannot see the buds. Your flowers appear more bell shaped. There is also another Heptacodium, H. miconiodes. Perhaps it would give you a start to unravel the puzzle? It does look very beautiful. Oh, thank you – I’ll do some research. This is a start. The flowers have a jasmine type fragrance. Hi Christina – it looks so similar, but the buds look different. Now I’m on a mission to find out what this is. Thanks for this! 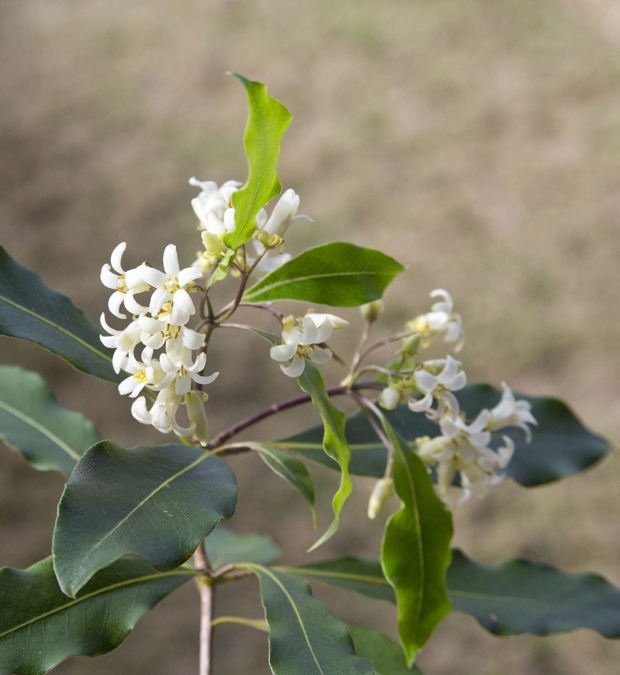 Possibly Pittosporum – waxy flowers with wonderful perfume and tough thick leaves. Names are just a botanical inconvenience particularly as I get older and have trouble remembering them. So just enjoy it. Gosh, I’m not familiar with it either. It’s beautiful, and I hope you’ll share the ID with us when you find out. My first thought is bay laurel, but I’ve never seen bay laurel blooms, so I don’t know if they look like that. Some of the bloom pictures of bay on the internet look similar to this plant. The leaves sure look like bay, though. I hope you find out what it is Happy hunting. Fascinating new plant! I’ve never seen anything like it and we don’t have it here in SE Texas. I would guess it is native to your area, but I’m not even certain of that. I’ll be eager to know what this is. Take a photo to your favorite garden store and let the employees take a crack at it. It’s a beautiful plant and flower and definitely a keeper.